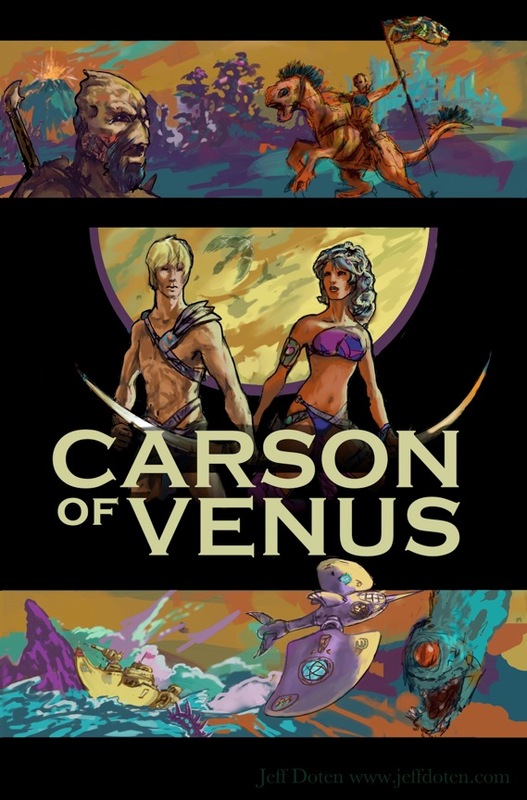 Jeff Doten, curator at Barsoomia.org and other cool sites (see the links below) has tipped us to a new Carson of Venus poster he’s made, and said we could share it. Jeff worked on Angelic Pictures Pirates of Venus project and his Skype address has “ofvenus” in it, so he may be the oracle on matters pertaining to Mr. Napier. Musings: What Would Hollywood Be Likely to Do With Carson of Venus? Oddly enough the Grandfather didn’t show up again ( in the draft I read ) I was sure he’d be the Grand Pooba of the Thorists or something. No, no, John Carson was from the Carson Napier project. He was probably the grandfather Carson searched for. John Carson ? Oh my. They want to do ERB so badly. If they were Asylum at least they would get it done … My suggestion to them was the title The Empress of Mercury ( just off the cuff ) which led me to paint this – http://jeffdotengallery.files.wordpress.com/2012/05/mercury-print-sized-sm.jpg At least something got done …. Now that you mention it, there’s indeed a movie called Space Samurai: Oasis that features the same players previously listed in the Carson Napier movie. One year to eventually see it! Monte Markham was slated to play John Carson in the failed project. It was originally a straightforward adaptation of Pirates of Venus. When they lost the license on the property they started skewing things so they could still make it, but be free of owing ERBinc anything. You’ll see new titles around like ‘Carson Napier’ as well, and IMDB notices saying it’s still coming.I told them they should just write their own Sword and Planet movie,I was pretty much done with the project at that time anyways. According to it, it doesn’t seem to take place on Venus at all! Is that a Myposean in the picture above? I love the anotar design, even if it looks more like a fish than a bird. Looks like a cool ship to fly in.